I love the delicious simplicity of this recipe. 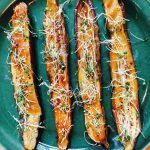 Miso Glazed Japanese Eggplant shines as an entree, or a side, and the addition of miso adds cancer fighting benefits as well as umami, making this my go-to recipe for eggplant. 2 Japanese eggplant washed and sliced in half. Brush both sides of the eggplant halves with 1tbsp vegetable oil. Combine all other ingredients, except sesame seeds and sugar, mixing until smooth. 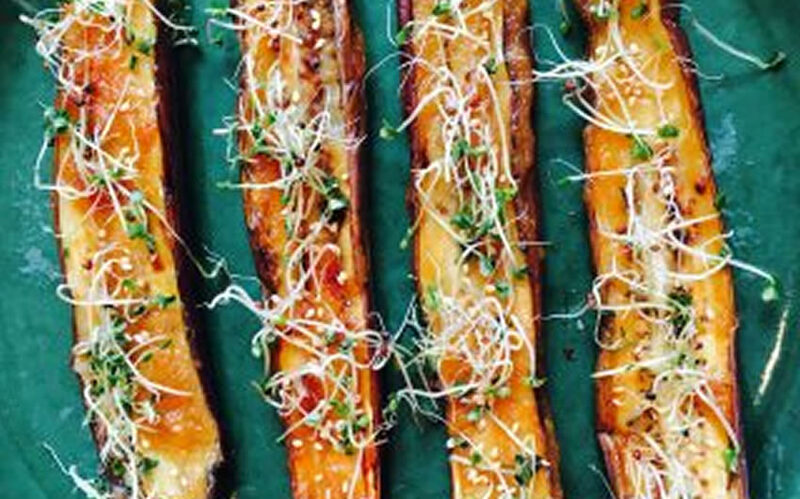 Place eggplant halves skin side up on a parchment or a silicone lined baking sheet. Broil on second level down from the element until skin starts to darken 3-5 minutes. Turn eggplant over and broil flesh side 2 minutes. Brush flesh side thickly with miso mixture, sprinkle with sesame seeds and sugar, continue to broil until bubbly and softened. Remove from heat and sprinkle with scallions or sprouts. Eggplant is an excellent source of dietary fiber and a very good source of vitamin B1, B6 and potassium. Research on the health benefits of eggplant have focused on a flavonoid in the skin called nasunin, a powerful antioxidant and free-radical scavenger, shown to protect cell membranes from damage. Miso is a good source of many minerals, including zinc, manganese, phosphorous, Iron, and copper. Miso also contains vitamin B2 and B6, as well as protein and dietary fiber. This pairs wonderfully as an entreé with my Asian Style Rutabaga and Carrot Salad recipe.